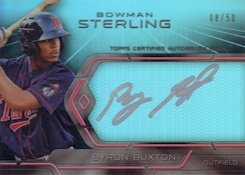 On a per box basis, 2013 Bowman Sterling Baseball delivers the most rookie and prospect autograph content of the year. A single pack has more ink than the average 2013 Bowman hobby box. Of course, it comes at a high price. But for those looking for sheer quantity, this is where to go. Every 2013 Bowman Sterling Baseball pack has three autographs. Spread that across six packs, that's 18 autographs per box. 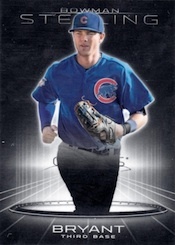 As with previous years, 2013 Bowman Sterling Baseball focuses on baseball's young stars. 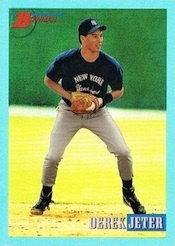 Nearly every card in the product features either a rookie or a prospect. The only place to find longtime veterans and retired greats is with the cross-brand Blue Sapphire Refractor set that celebrates some of the top Bowman-branded rookie cards of all-time. The vast majority of autographs will be on-card once again. The main autograph sets also have a different design, switching from 2012's horizontal take to a more futuristic vertical look. Autographs come with many Refractor parallels, all of which are numbered: base Refractors (#/150), Green Refractors (#/125), Ruby Refractors (#/99), Orange Refractors (#/75), Gold Refractors (#/50), Blue Refractors (#/25), Purple Refractors (#/10), Canary Diamond (#/3), Red Refractors (1/1) and Superfractors (1/1). Each card also has Printing Plates. 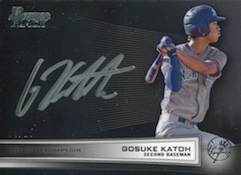 Collectors looking for multi-signature cards can hunt for Dual Autographs. Like base autographs, they have Refractor versions as well: Refractors (#/35), Blue(#/15), Purple (#/5), Canary Diamond (#/3), Red (1/1), Printing Plates and Superfractors (1/1). The Duel (#/15) is another multi-signature set. It is a winning entry from an online contest that asked collectors to come up with their own idea. 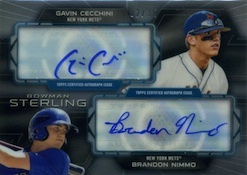 2013 Bowman Sterling Baseball also has a handful of additional autographs. 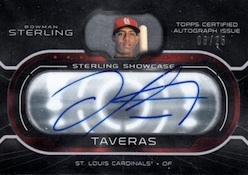 Sterling Auto Showcase honors the top prospects from 2013. Each card is numbered to 25 while a Sterling Silver parallel is numbered 1/1. Sterling Blue Sapphire Signings (#/50) use silver ink on blue backgrounds. Parallels include Ruby (#/25) and Superfractors (1/1). 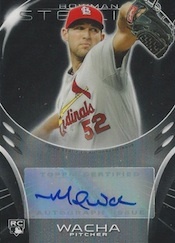 Nickname Autographs (#/15) are inscribed by the player. Bowman Black continues with another 25 cards, each numbered to 25. 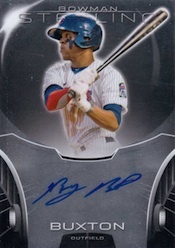 Although much of the attention for 2013 Bowman Sterling Baseball is on the autographs, collectors shouldn't overlook the base rookies and Prospect inserts. Including Refractor parallels, they fall just one per pack. With such a lofty price tag, individual singles should prove to be somewhat difficult to find over time. Refractor parallels for the all-rookie base set and Prospect cards include Refractors (#/199), Gold (#/50), Blue (#/25), Purple (#/10), Canary Diamond (#/3), Red (1/1), Printing Plates and Superfractors (1/1). Random 2013 Bowman Sterling boxes have a special Autographed Box Loader that is numbered to 20. These have one-of-one Superfractor parallels. Base set Japan Fractor parallels (#/5). 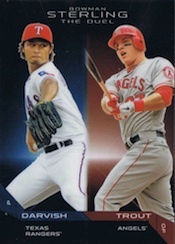 Prospect Japan Fractor parallels (#/25). Asia-Exclusive Autographs (#/100 or less). Yu Darvish Refractor Die-Cuts (five cards, #/25). Parallels: Autograph (#/3), Autographed Relic (1/1). 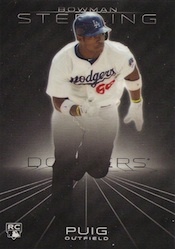 Hyun-jin Ryu Refractor Die-Cuts (five cards, #/25). Parallels: Autograph (#/3), Autographed Relic (1/1). 2013 Bowman Sterling Prospect KEVIN ZIOMEK Autograph Detroit tigers! 50 cards. All are rookies. Way too many sticker autos….some of the same guys from last year….not too impressed….. Question though: Jose Fernandez, Xander Bogaerts, Yasiel Puig all have redemption autos, but do regular base autos redemption or otherwise exist for these three guys ???? Such a poor effort. Nothing new. Anything of interest is diabolically rare. Outrageously overpriced. Everything that’s wrong with the hobby right now, but also, everything that is driving it. all cards have defects. I bought a case and for 1 card in the whole case that would grade. It is same as any Topps redemption. They all have defects. Mishandled somewhere along the line. Great product, great box for me. Only 16 of 18 on card auto (1 x Redemption). Pulled Dual AU/35 Cubs. Happy to find grade worthy Joc Pederson Green AU/125 and my box included Box loader redemption for oversized 5×7 6 Auto card (SS/INF). WAY too many parallels. I mean, I don;t mind one or two types of parallels. But to have 3 quarters of a dozen parallels? I mean, come one, already! Enough! 2013 Bowman Sterling Baseball Factory Sealed Hobby Box 18 AUTO's AARON JUDGE? 2013 Bowman Sterling HOBBY BOX 18 Auto (Aaron Judge Kris Bryant Refractor 1 1)? 2013 Bowman Sterling Sealed HOBBY BOX-18 Autos-Judge!